In the end, getting down Delaware Bay was a matter of picking the right weather. That's a phrase you read a lot in cruising guides: "Pick the right weather to cross ______". Fill in your favorite nasty stretch of open water. But picking the right weather isn't so easy. First, you need to know what the right weather is. Before heading down the Delaware, I thought a lovely NW wind -- blowing me straight down the bay -- would be the ideal weather. What could be better than a 'fair wind'? Isn't that what sailors dream of? In most cases, yes, but on the Delaware, a NW wind quickly kicks up a nasty sea. I suppose it is the combination of wind, tidal currents, and shallow water. Whatever the cause, the added ingredient needed to choose the 'right weather' is local knowledge. Another one of those phrases often used in cruising guides... I'm seeing a pattern, here. I worked all this out in my head while walking around Olde Greenwich. Okay, fine. Ideally, I wanted a N wind. But I couldn't order up a N wind from the weather service. How long would I have to wait for it? I couldn't wait forever. The weather was already turning cold. I only had so many days left before I'd have to pack it in for the winter. I needed to keep moving. It was a great relief, therefore, to discover that the forecast for the very next day was for N wind, 10-15 knots. My luck was still holding. Or King Neptune was looking out for me. Or whatever. I went to bed early and popped up before dawn, determined to leave the dock the moment I could make out the markers. In the end, the Delaware was an easy sail. The Cohansey was glassy when I set off, but a good breeze had set in by the time I got to the Delaware, almost an hour later. As predicted, I had the wind on my quarter and I put up all my working sail to make the most of it. 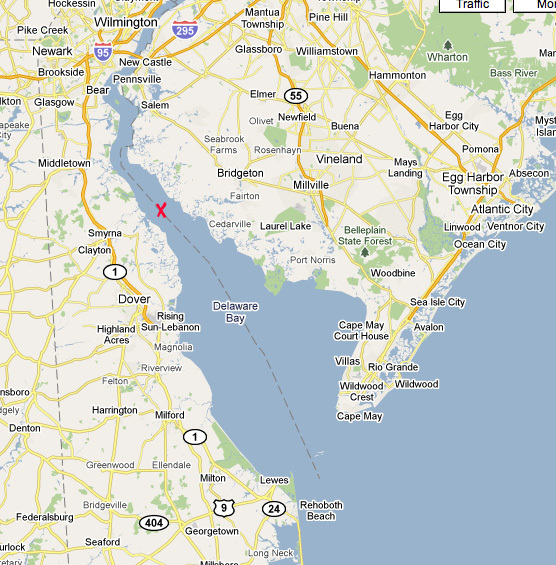 We made hull speed most of the way down the Delaware, with just the right amount of wind to keep us moving fast. Also as predicted, the N wind did NOT kick up the same sort of vicious chop that I'd seen 2 days before. In the wide part of the lower bay, it might have kicked up 2-3', but that is no problem for the Blue Moon. Of course, we were back in the land of rude power boaters, but I was so happy to be across the Delaware, that I found myself waving cheerfully as we wallowed in their wakes. We were in New Jersey proper! On the home stretch! Just the notoriously shallow NJ ICW to cope with. 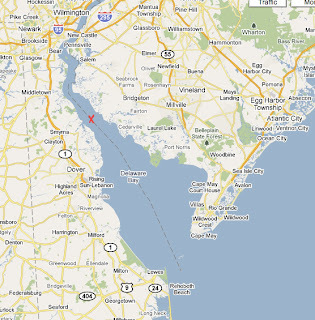 But surely, that would be a snap after the Delaware Bay. Good luck on the final stage of your return home. From down here in Fla it looks kinda COLD where you are now! Fair winds and mild temps! Anxious to hear about 'The NJ Shallows" !! Back in another life, I rode my motorcycle over the DelMemBr (Delaware Memorial Bridge). In January. With a north wind blowing. There i am, riding over pierced steel planking high above the river, unable to feel my feet or my fingers, leaning into the wind threatening to blow me off the bridge... If experience increases one's intelligence, I am freakin' Einfreakinstein now. I can't wait to hear about the Unlikely Voyager/Jersey Shore mashup sure to come, now that you are past Cape May. Breakfast, yes. Sail, maybe. Tan, hell no!